Peter Hogarth Doyle was born in Lithgow, NSW on 27 September 1925 and educated at Caulfield Grammar School, Melbourne and Trinity Grammar School in Sydney. He entered the Royal Australian Naval College, at Flinders Naval Depot, in 1939 as a 13 year old cadet midshipman. He was given the nickname 'Daphne" by his peers and this stuck for the rest of his naval career. He graduated in 1942, was promoted midshipman, and joined the Royal Navy's Eastern Fleet serving in the battle ship HMS Resolution during October 1942 to April 1943 and then in the cruiser HMS Kenya until early 1944. During this period the ships were active in the Indian Ocean and supported the campaign in Burma. In April 1944 he proceeded to the United Kingdom to undertake professional naval courses in gunnery, signals, torpedoes, navigation, seamanship, aviation and anti-submarine warfare. Doyle was promoted sub-lieutenant on 1 July 1944 and after completing his courses joined the destroyer HMAS Napier, at Chittagong in India, in November 1944. The destroyer served in the Burma campaign and as part of the British Pacifc Fleet in the northern Pacific Ocean and was present at the Japanese surrender in Tokyo Bay in September 1945. Doyle served briefly in the destroyer HMAS Quality in late 1945 and was promoted lieutenant in December of that year. Lieutenant Doyle was appointed to the destroyer HMAS Bataan in January 1946 and served in her for the next two years including service in Australian waters, Southeast Asia and conducting two periods of service in Japan as part of the British Commonwealth Occupation Force (September 1946 - January 1947 & August - November 1947). In February 1948 he proceeded to the United Kingdom for training as a navigator and fighter direction officer. He served in a variety of ships and bases including HMS Dryad (Maritime Warfare School), Loch Glendhu (frigate), Ocean (aircraft carrier), Boxer (radar training ship), Pelican (sloop), Mermaid (sloop) and Sea Eagle (shore base in Derry, Ireland). He finally returned to Australia in October 1951 and was appointed to the destroyer HMAS Anzac in December of that year as navigating officer. The destroyer had recently returned from active service in Korean waters. Anzac conducted a maintenance period and then began a period of training in preparation for her return to the Korean War. On 1 September 1952 Anzac sailed from Australia for her second deployment to Korea. She arrived in the war zone on 27 September and was active in bombarding enemy positions ashore. On 16 November she was engaged in a lengthy gunnery duel with North Korean coastal batteries near Cho Do, on the west coast, which saw the ship straddled by several rounds before the North Korean guns were silenced. Doyle was subsequently mentioned in dispatches for his service in Korea (London Gazette 10 November 1953) with the citation reading - He showed great ability and was most reliable in carrying out the duties of navigating officer though inshore operations during severe winter conditions proved an exacting task. He showed commendable coolness when the ship was taken under accurate enemy fire. Anzac returned to Australia on 3 July 1953 after nine months in Korean waters. Shortly after returning from Korea Peter Doyle married Eunice Anne Treacey, on 8 August 1953, at John Knox Church, Gardenvale, Victoria. The two had met when the blood bank, for whom Anne worked, toured Anzac during a visit to Melbourne. They later had three children. Doyle was promoted lieutenant commander on 1 December 1953 and remained serving in Anzac until late May 1954. He then served briefly in her sister ship Tobruk, in June, before a posting to HMAS Watson as a navigation instructor. Doyle proceeded to the United Kingdom, in late 1954, to become commissioning crew for the new RAN aircraft carrier Melbourne then being built at Barrow-in-Furness, Lancashire. HMAS Melbourne was commissioned on 28 October 1955 and after completing her various sea trials she sailed for Australia arriving in Sydney on 9 May 1956. Lieutenant Commander Doyle transferred to the aircraft carrier HMAS Sydney on 14 May 1956 as navigating officer and served in her until May 1958. During his time in Sydney the carrier operated as the fleet training ship for both aircrew and sailors. She operated in Australian, New Zealand and Southeast Asian waters until placed in reserve in late May 1958. 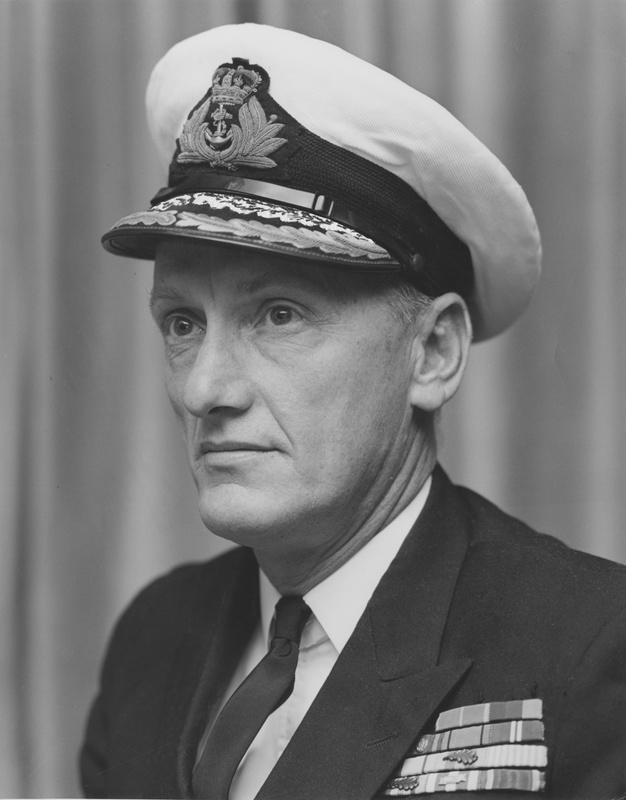 Doyle returned to Melbourne in July 1958, was promoted acting commander (which was confirmed on 31 December of that year) and became the fleet navigating officer. While serving in Melbourne the carrier operated in Australian and New Zealand waters as well as deploying to Southeast Asia as part of the Far East Strategic Reserve during March - May 1959. In November 1959 he joined the staff of the Flag Officer in Charge East Australia as the maintenance commander. In February 1961, Commander Doyle was appointed to the staff of the Captain of the Port of Sydney (HMAS Kuttabul II) as Deputy Captain of the Port and Master Attendant controlling all warship movements in and out of Sydney on a daily basis. On 29 August 1961 Doyle was given his first command - the anti-submarine frigate HMAS Quickmatch. The ship was in dry dock at Williamstown Dockyard, Victoria and did not emerge from maintenance until early October. She then commenced sea trials and workups and on completion, in late November, sailed for Singapore and service in the Far East Strategic Reserve. Quickmatch spent Christmas in Hong Kong and after a brief visit to Subic Bay in the Philippines returned to Singapore. During 25-29 January 1962 she visited Saigon in South Vietnam, in company with the destroyer HMAS Vampire, for diplomatic engagement with the South Vietnamese Navy. Visits to Ceylon, Malaya and Singapore followed before Quickmatch returned to Australia in early April. The ship operated in Australian waters for the remainder of Doyle's time in command. He handed over to Lieutenant Commander Christopher Spurgeon, RAN on 15 October 1962 and soon after Doyle proceeded to the United Kingdom to undertake a short technical course at the Royal Navy Training School at Woolwich, in December 1962, followed by undertaking the Royal Navy Staff Course during 1963. On return to Australia in early 1964 Commander Doyle joined the staff of the Fleet Commander, as the Fleet Operations Officer, and he was frequently embarked in either Sydney or Melbourne with the Fleet Commander. He became Chief Staff Officer to the Fleet Commander from April 1964, with the rank of acting captain, and was confirmed in the rank on 31 December 1964. Captain Doyle was appointed in command of the guided missile destroyer HMAS Perth on 12 July 1966. In early 1967 Perth began to be prepared to deploy to South Vietnamese waters to relieve HMAS Hobart; which was the first RAN warship to be attached to the US 7th Fleet on operations during the Vietnam War. Perth arrived in Subic Bay on 14 September 1967 and took over from Hobart shortly after. HMAS Perth arrived off the coast of Vietnam on the 26th and fired her first support mission that afternoon. During her six months in Vietnamese waters Perth fired 13,351 rounds at a variety of enemy targets. She also had the dubious honour of being the only RAN ship deployed to Vietnam to be hit by enemy fire. On 18 October 1967 Perth was operating in the Gulf of Tonkin, near Sam Son, with the heavy cruiser USS Newport News when she came under fire from North Vietnamese coastal artillery batteries. As Perth turned away she was struck by a single enemy shell which glanced off her aft 5-inch gun mount, penetrated the deck and exploded. Both her guns remained in action returning fire, however, four of her ships company were wounded by the exploding shell - two seriously and requiring medical evacuation to Subic Bay. During her service in Vietnam Perth came under enemy fire on three more occasions but was not hit. The destroyer departed the war zone on 23 March 1968, handing over to Hobart on the 30th at Subic Bay and arriving back in Sydney on 10 April 1968. Captain Doyle relinquished command the next day to Captain David Leach, RAN. Perth was subsequently awarded a US Navy Unit Commendation, on 21 July 1969, for her service in Vietnam. Doyle was again mentioned in dispatches (London Gazette 18 July 1968) for devotion to duty in the presence of the enemy. Those who served with him in Vietnam recalled him as temperamental, 'more feared than loved' and quick to be critical of performance. The Fleet Commander at the time, Rear Admiral Richard Peek, RAN wrote of Doyle He is intensely ambitious and although he gets on well with his seniors he is inclined to drive rather than lead. For this reason I believe the men will be intensely proud to have served in Perth rather than happy to have served under Doyle. Doyle headed the Naval Intelligence Directorate, in Navy Office, from July 1968 to the end of 1970 and was appointed as an Officer of the Order of the British Empire (OBE) in the 1970 Queens Birthday Honours for long and distinguished service to the RAN. He undertook study at the Imperial Defence College, London in 1971 and on returning to Australia was appointed as commodore and took command of the Junior Recruit Training Establishment (HMAS Leeuwin) in Fremantle, Western Australia on 1 February 1972. This position also had the additional responsibilities of Naval Officer Commanding Western Australia. On 28 March 1973 his rank of commodore was formalised as a rank, rather than as a position, to bring the RAN into line with the other two services. In February 1975 Doyle returned to Navy Office as the Director General Naval Operations and Plans. This was a short lived posting as Commodore Doyle took command of the RAN's flagship, the aircraft carrier HMAS Melbourne, on 12 January 1976. During his time in command the carrier underwent a refit (January - May) at Garden Island followed by sea trials, work up and embarkation of the Carrier Air Group, in the East Australian Exercise Area, during June - September. Melbourne visited her namesake city in October before returning to home port for maintenance and the Christmas leave period. Commodore Doyle handed over command of the ship to Commodore Rothsay Swan on 14 January 1977. Doyle was promoted rear admiral on 24 January 1977 and appointed Chief of Naval Materiel where he was responsible for the many Navy acquisition programs for new equipment and maintenance of that already in service. In early 1979 he became the Chief of Joint Operations and Plans within the Department of Defence. Rear Admiral Doyle was appointed as an Officer of the Order of Australia (AO) in the Australia Day Honours List 1980 in recognition of service to the RAN, particularly as Chief of Naval Materiel and as Chief of Joint Operations and Plans. In May 1980 he became the Flag Officer Commanding the Australian Fleet. During his tenure the fleet operated widely throughout Southeast Asia, the Pacific and Indian Oceans with particular concern for the increased Soviet Navy operations in these areas. Doyle embarked in the flagship Melbourne on a number of occasions. The RAN was undergoing a period of significant change as well with the first of the new guided missile frigates entering service and plans to replace Melbourne with the Royal Navy aircraft carrier HMS Invincible well advanced; however following the outbreak of the Falklands War in early 1982 this plan was modified. Plans to replace the aging Attack class patrols boats with the new Fremantle class were also well advanced with the lead boat HMAS Fremantle commissioned in March 1980, in the United Kingdom, arriving in Australia later that year. The oceanographic research vessel HMAS Cook, built at Williamstown Dockyard, had also recently been commissioned and the new tanker, Success, was laid down at Cockatoo Island in late 1980. Rear Admiral Doyle took up his last appointment in the RAN as the Deputy Chief of Naval Staff in June 1981 where his role was as the main administrator for the navy. He retired from the RAN in July 1982. In retirement he was a keen golfer, ACT chairman of the Queen Elizabeth II Trust and a strong supporter of Legacy. His wife, Anne, died in 1996 and Rear Admiral Peter Doyle died in Melbourne on 2 May 2007. 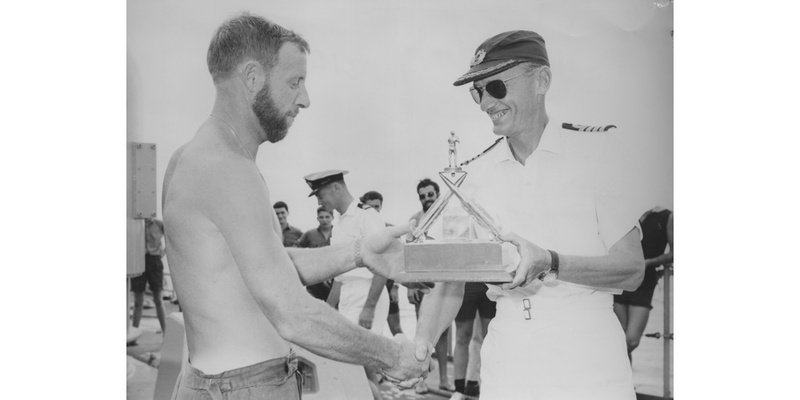 Captain Peter Doyle presents a sporting award to Able Seaman Radar Plotter Roy Holdcroft onboard HMAS Perth. 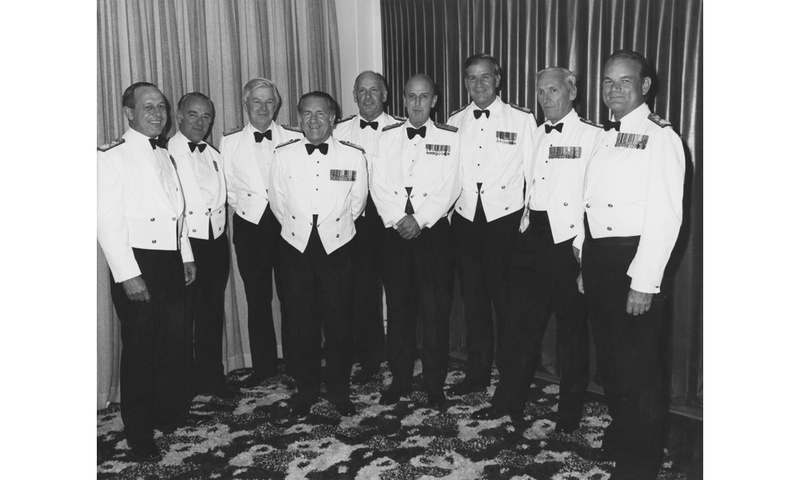 Royal Australian Navy senior officers at a mess dinner in Canberra, ACT on 9 March 1981. L-R: Rear Admiral Stevens, Rear Admiral Lynam, Rear Admiral Rourke, Rear Admiral Swan, Vice Admiral Willis, Rear Admiral Loosli, Rear Admiral Leach, Rear Admiral Doyle and Rear Admiral Robertson.